While their are several Open Source alternatives for Named Entity Extraction (e.g. Stanford NLP, OpenNLP, Freeling) available none of them was initially integrated with the MICO Platform. Instead all Text Extraction capabilities of MICO where backed by the Redlink Platform. This blog post will present a Open Source alternative for MICO based on OpenNLP and the high quality NER (Named Entity Recognition) models provided by IXA Pipes NERC. It supports the most common NLP tasks, such as tokenization, sentence segmentation, part-of-speech tagging, named entity extraction, chunking, parsing, and coreference resolution. These tasks are usually required to build more advanced text processing services. OpenNLP also includes maximum entropy and perceptron based machine learning. For the extraction of Named Entities one does require the tokenization, sentence segmentation and named entity extraction capabilities. Most of the features of OpenNLP are based on machine learning algorithms (max entropy and/or perceptron). All such components need to be configured with models that need to be trained beforehand. While OpenNLP provides a set of models via its old sourceforge.net homepage those models are more for demonstration purposes. For real world use cases they typically do not provide the required quality. The IXA Pipes project by the University of the Basque Country provides extensions and high quality Named Entity Recognition models for OpenNLP for Basque, English, Spanish, Dutch, German and Italian. Note: MICO only provided Debian packages for the bold languages. Packages for other languages can be added by Users. Or the Extractor can also be configured to directly load models from disc. As OpenNLP (and Named Entity Recognition in general) requires to use different models for different languages one needs to ensure that the language of processed content is known in advance. To satisfy this requirement a Language Detection Extractor for textual content was also added to the MICO Platform. This extractor is based on the language detection library by Nakatani Shuyo (Cybozu’Labs). It does support 53 languages including all the languages with NER models available. The following listing shows a Language Annotation specifying that the test:asset-1 of the Item test:item-1 is written in English. 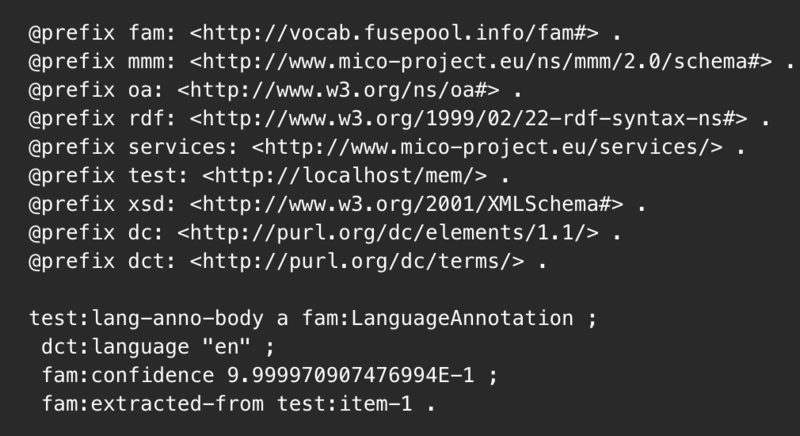 This is the actual Language Annotation as defined by the Fusepool Annotation Model. This defines that the language is English and the confidence of the detection is 99.9997%. This defines the Item including a Asset with the text/plain content. The remaining RDF is the mmm:Part (also an oa:Annotation) and the other WebAnnotation constructs used to define that this annotation is valid for the whole text. Tip: as alternative to using language detection it is also possible to already include an according annotation when injection a new Item to the MICO Platform. OpenNLP Named Entity Extraction consists of multiple Debian packages. First the mico-extractor-opennlp-ner package that provides the Extractor and mico-extractor-opennlp-ner-models-model-en, mico-extractor-opennlp-ner-models-model-es, mico-extractor-opennlp-ner-models-model-de and mico-extractor-opennlp-ner-models-model-it providing the models for the given languages. Nach seinem knappen Sieg bei der Bundespräsidentschaftswahl wird Alexander Van der Bellen bereits am Dienstag von seinem künftigen Vorgänger Heinz Fischer in der Hofburg empfangen. Am Mittwoch wird der unterlegene FPÖ-Kandidat Norbert Hofer dort erwartet. Die FPÖ will indes in einem Bundesparteivorstand über die Konsequenzen aus der Wahlniederlage beraten. FPÖ-Generalsekretär Herbert Kickl schloss eine Wahlanfechtung nicht aus. This is the Entity Mention Annotation as defined by the Fusepool Annotation Model. It defines the mention, the type and links to the selector and the content the entity was extracted from. oa:suffix " in d" . This is a combined oa:TextPositionSelector and oa:TextQuoteSelector that defines the selection by both char offsets as well as prefix/exact/suffix. The later is especially important if the input text was a rich text document as in such cases char offsets are not very useful to re-locate the selected part of the text in the original document. The rest of the RDF describes the mmm:Item, the mmm:Part representing this annotation and some other required OpenAnnotation classes. As the RDF annotation are fully compatible to those generated by the MICO Extractor based on the Redlink Platform this extractor can be used as an 1:1 Open Source replacement in existing Usage Scenarios that require Named Entity Extraction.